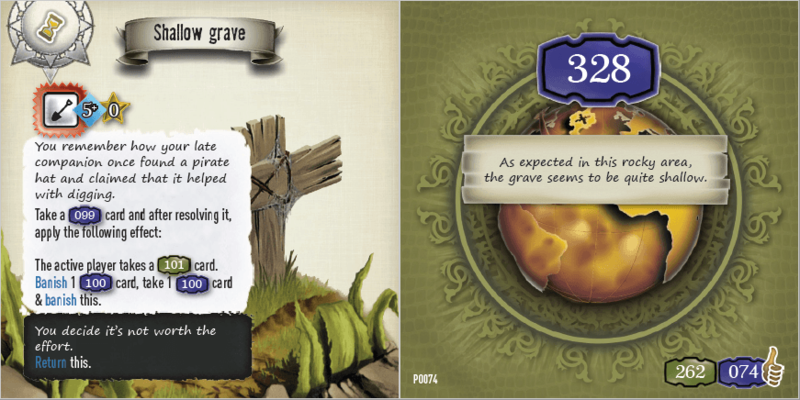 A fan-made mini-expansion is nearly finished - I plan to publish it before November. Many things and even more people got lost on the 7th continent. Some want to be found, some do not, and some should not. 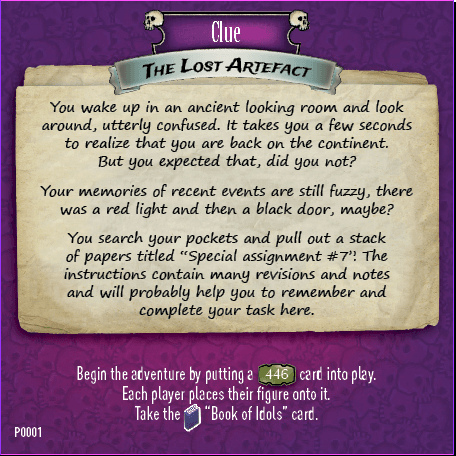 1 Clue card for the new curse of "The Lost Artefact"
You can play with the new "The Lost Artefact" curse, alone or alongside any other curses. The expansion is primarily meant for the players who "have seen it all". Good knowledge of the continent will come in handy, however, there are enough hints that you shouldn't get completely lost even without previous experience. The main idea is that no cards from this expansion (which will be printed by people and would differ in quality from the official cards) are ever shuffled with the original cards. The Blue Adventure cards form their own deck with green and golden numbered cards - the only difference is that their "numbox" is blue. Let me know if you'd like to print it and do a playtest this month (The expected play time of the new curse alone is approximately 7 hours, more with all the optional side quests). The current version is 95% ready, I just need to add some graphics and do a final check of grammar, layout and card numbers. Thanks for keeping us informed here ! I just sent a message in the french part of this forum for more followers. When you will publish the final version, post it in the "Rules-and-operating-points" part of the forum, and I'll pin it. We look forward to play your fan-made expansion (feel free to send it to us before releasing it if you want our “feedback”). Just so everybody knows, we are totally open with fan-made content as long as it remains free for all and identified as "non-official fan-made content". Also, we’ll soon provide (like before the end of next week) a fan-kit including official icons and card backgrounds. I'll be interested in any feedback from the designers, thanks for the offer. I'll also make sure there is a big enough disclaimer about the "non-officiality" in the files when published. One final sneak-peak. 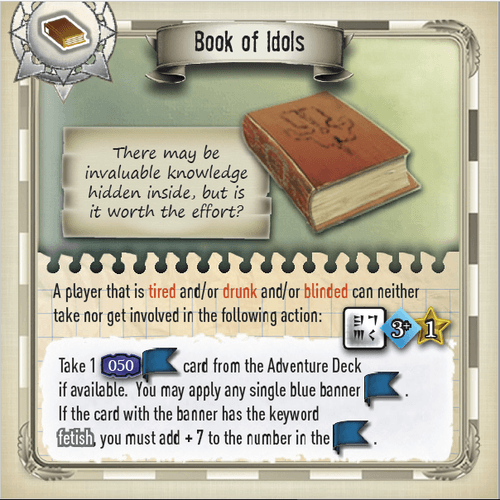 The "Book of Idols" card itself. This is the best news I've heard in months! I can't wait to ditch my own templates. I'm also blown away by the amount of time and work on display here. This fan expansion looks amazing! Inspires me to pursue some of my own more ambitious ideas. I love the design of Book of Idols. I have a two-person group of pretty experienced players very interested in custom content (working on some of our own.) We'd love to playtest! Thrilling!! Congratulations and thank you for putting something like this together -- and thank you to BrunoS for taking the lead on supporting this sort of thing! The fan-kit would be a great boon. I made an account to respond to this -- really looking forward to trying out your modules. This looks awesome! I may just try to find a place that can print cards here. I just finished your mini-extension. Congratulations, it's a great work, and I fell it truly respects the spirit of the game as intended by the authors. It also gives experienced explorers a good way to use their knowledge of the continent, and you really need to know a lot of things to succeed in this adventure. Furthermore, during the game, I revealed only half of the cards you designed, so I'm sure there are others surprises if I do the adventure again. Thanks for making this. It was very cool. Hi, thanks for the feedback, I'll ask for more spoilery things in the PM. About the French translation - thanks for the offers. I'll consider it after the english version is released. If you're still looking for playtesters, I'll give it a whirl. I only have the base box so I can't check all the interactions though. From the hints you've shown the content looks great! Big thanks to all the playtesters who tried it and made it better.